On Sunday, I was out running the off-road bike trails in the Sumter National Forest in Edgefield County, SC about twenty minutes from Augusta, Ga, and ran up on this beautiful colony of Sabal minor. Minors are actually pretty common in inundation and seepage areas in the forest, but can be found on steep slopes well away from obvious water sources. This colony was at 285' in elevation or a little less since I was up above them to take the picture. On some of the other trails, the colonies are even more extensive. Beautiful habitat photos. Might be fun exploring close before weed & bug season gets here. You might find a undiscovered variety. Nice pictures and great find! It's interesting how Sabal minor seem to cling to the moist areas of the forest. Yet, like you said, they also can grow in drier areas. 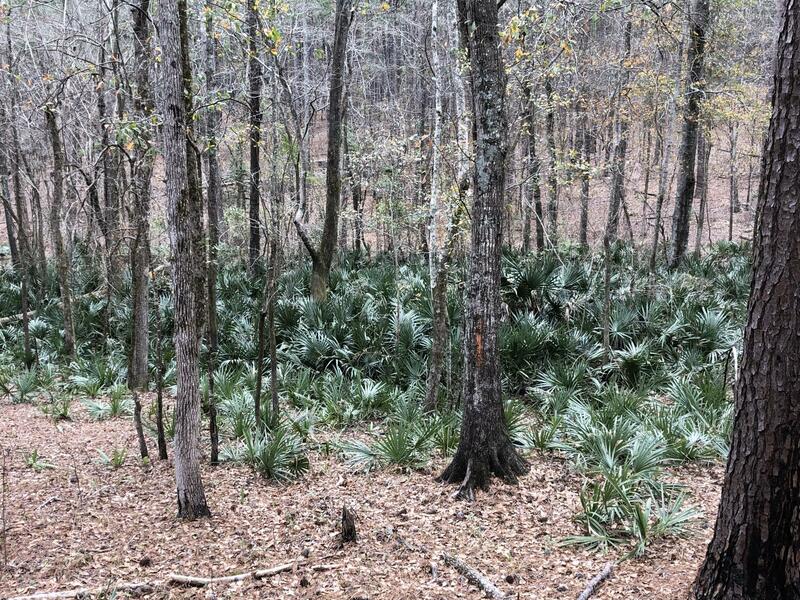 One of the most interesting areas I have seen Sabal minor growing wild was in a pine savanna also in South Carolina. 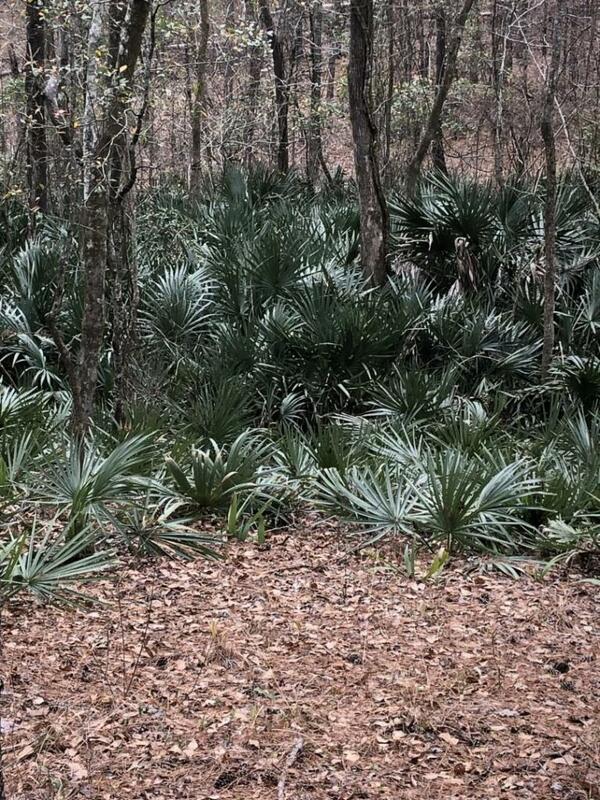 There was no water sources that I could see and it seemed pretty dry, yet there were scattered Sabal minor. Great pics Joe. Down here in the lowcountry there are thousands of pockets of minors. You can drive around & you'll find a colony with small minors, nothing for a mile or two & then another colony with totally different looking minors. Some colonies have thousands & some are lucky to have 50. Right Laaz. Same here in Georgia. Right across the river from Augusta is Gum Swamp. The minors are in the thousands! Sometimes I think that they are missing in certain areas because agricultural interests used the land and wiped out the minor and lots of other stuff as well. Wonderful pictures of Sabal minor. Would be nice to grow Sabal minor in the forests here in Germany too but I think summer heat and sun are missing. Started to built up my own S. minor collection (actually only three different ones) as this could be a palm I can grow outside besides the Trachies. I'm always checking the Inet for new seeds. Same here in NC. In some counties, Sabal minor is listed as an invasive weed while in others counties Sabal minor has been displaced from habitat disruption. Could I Plant These Now? So I have these Sabal minor, and this weekend is going to be in the 70s and not get too cold, even at night. But over the week the highs are in the mid to high 50s and the lowest low is 30 (one night). Would I be rushing these or do you think they world be ok to be planted now? Would they be able to handle a frost freshly planted? So we had a pretty windy Winter here, the Needle Palm is exposed to it and there were many days where it literally looked like it was going to rip out of the ground (of course it wouldn't, but it was blowing around A LOT). Here it is looking good! It's ready for the heat. This is a continuation of the Sabal minor post from a few days ago. Same trail (Great Wall) in the Forks Area Trail System off-road bike trails in Edgefield County, SC, about 20 minutes north of Augusta, GA. In the photographs, beginning with the map, the pictures are in ascending order by elevation. The trail is the red one on the map and you can see how close it gets to a finger of the Savannah River. There are fairly steep gullies leading down to the river. In places, Sabal minor is really thick and then a little further down in what seems to be prime palm habitat, there won't be any. My speculation is that when cotton was grown here, the palm-empty areas were arable, while the steeper areas never were usable for crops. The first picture after the map was taken at 211', but pretty high up above the palms. It was a warm day and I didn't have time to get down to the bottom.....or time to deal with a little snake bite! I think that I was about 30'-40' above the palms. There were lots of seedlings above the main population of S. minor. Again, maybe they are expanding their territory again since there is no agriculture here now. This is national forest that is logged occasionally. They do controlled burns about every three years. I had a thread with a bunch of things about VA Beach Sabal palmettos, with pictures and streetview links, but just could not find it. Anyway, here is a nice Sabal palmetto in Virginia Beach, Virginia. Notice how it is inland. Also, apparently there is a street called "Palmetto Avenue" in Virginia Beach just down the street from this nice palmetto. The palmetto is the pin on the map, the other pin shows Palmetto Avenue. I did not expect palmetto to be in the name of anything north of North Carolina, so that's neat.